Top-of-the-line Pilot EX-L and Touring models can easily pass the $40k mark. Because that's so near a luxury-brand price tag (like that of Honda's own Acura MDX), think twice; we see base LX and EX models to be the best value. Don't let the macho-boxy look intimidate you; the Honda Pilot makes a lot of sense for large families—especially with improved mileage and a most tasteful front-end design for 2012. The Honda Pilot might at first glance look like yesterday's news—like the kind of ruggedly styled, truck-based SUV that's gone out of favor. But in truth, it's one of the better choices for everyday, on-the-road family use—especially if you're the type to eschew minivans—and the overtly boxy body yields an especially roomy interior. For 2012, Honda has given the Pilot what amounts to a mid-cycle refresh, doing away with the oddly framed, grille introduced in 2009 and instead substituting a more tasteful grille that we see, simply, as a more vertical take on the brand's passenger-car front ends. Back at that last redesign, the Pilot became even more macho, creased, and imposing, with a chunky look that we liked, other than garish grille, so we'll consider that a victory. Interior themes are also a bit gimmicky and overwrought in a chunky, macho aesthetic. A five-speed automatic transmission is paired with the familiar 250-horsepower, 3.5-liter V-6 in the Pilot, and it altogether keeps with Honda's smooth, responsive, and sweet-sounding reputation for these powertrains, while improving the highway rating on front-wheel-drive models by 2 mpg, to 25 mpg—making it the most fuel-efficient three-row eight-passenger vehicle, according to Honda (now 17/24 mpg with 4WD or 18/25 mpg with front-wheel drive). A cylinder-deactivation system remains to help cut fuel consumption while coasting or cruising, and we've found real-world ratings to be on the high side of those estimates. Handling is much better than the tall silhouette suggests, and once you get past the initial surprise of the tall driving position, you'll find handling to be reasonably crisp, with good maneuverability. 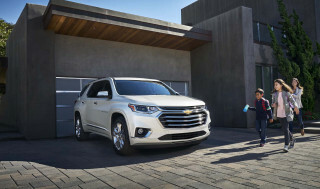 With a carlike unibody design, bolstered structurally with some of the benefits of an SUV, the Pilot is able to draw from the best of both worlds. Ride quality is on the firm side, but the optional four-wheel-drive (actually all-wheel drive) system has a Lock mode and is a champ in deep snow or mud. Four-wheel-drive models can tow up to 4,500 pounds. The Pilot's interior is roomy and functional, and it's one of few vehicles this size to have a third row that's spacious enough for adults—though headroom is tight in the far back and you'll sacrifice cargo space to use it. Front seats are generously sized and excellent for long road trips, while the second-row seats slide fore and aft for easy access to the third row or to get just the right balance of legroom between rows. Both the second and third rows fold forward and are split 60/40, and overall, the interior just brims with functionality in the form of cubbies and bins. The only common criticism from our editors is that the dash feels cluttered, and there are too many hard plastic surfaces just ahead of the driver. However otherwise the Pilot feels very refined and quiet—and Honda has made further improvements in this area for 2012. Family safety is probably a top priority for the Pilot's family shoppers, and here it's reassuring but not exactly top-notch. Side-curtain bags cover all three rows, and its feature set is just as good as any vehicle in this class; test results have been pretty good, and the Pilot is a Top Safety Pick, but features like a rearview camera aren't available on base versions. From a feature standpoint, the big news for 2012 is top-and-center on the dash; Honda has brought the information screen it terms i-MID—a color LCD screen that shows trip computer and audio functions up more in the line of sight. It also includes enhanced steering-wheel controls. But as anyone who's shopped Honda before will know, desirable features are kept for more expensive trims, and that new display is only on EX-L models. The Pilot is available in four different trim levels—LX, EX, EX-L, and Touring—each of which is offered in 2WD or 4WD. You'll need to step up to EX-L or Touring trims to get upgraded leather upholstery. That said, base 2012 Honda Pilot LX models come with rear air conditioning, keyless entry, cruise control, and a seven-speaker sound system, while the top-of-the-line Touring includes a host of tech features, such as a nav system, a rearview camera, a Bluetooth hands-free interface, a USB audio plug, backup sensors, and available rear DVD entertainment. Also for 2012, the navigation system has been updated and includes 15 GB of media storage. The 2012 Honda Pilot is against-the-grain boxy--in mostly a good way, though some might think the details are a little overwrought. For 2012, Honda has given the Pilot what amounts to a mid-cycle refresh, doing away with the oddly framed grille introduced in 2009 and instead substituting a more tasteful grille that we see, simply, as a more vertical take on the brand's passenger-car front ends. Overall, though, Honda appears to be running in the opposite direction, style-wise, than the rest of the industry. And that could be a good or bad thing, depending on your taste. 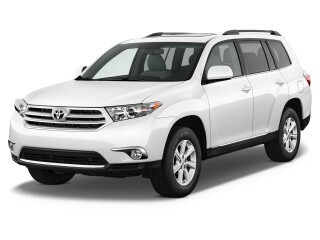 Back at its last redesign, for 2009, the Pilot became even more macho, creased, and imposing, with a chunky look that we liked, other than garish grille, so we'll consider that a victory. 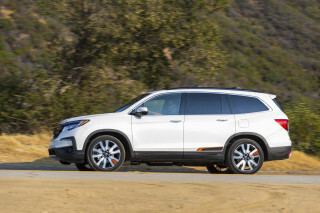 Inside the Pilot, controls can feel a little cluttered, and the themes are a little gimmicky and overwrought, but it does continue the theme from the exterior--chunky, macho, and more upright than the cabins of most other crossovers. 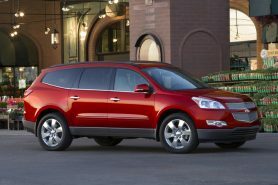 The 2012 Honda Pilot performs much better than its boxy exterior might suggest. 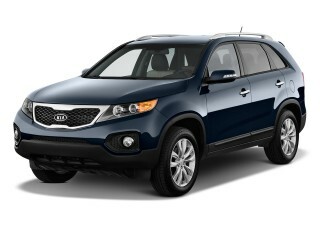 The Pilot's already impressive powertrain performance gets a little better for 2012. The 250-horsepower, 3.5-liter V-6 carries over, as does the five-speed automatic, but with . The V-6 definitely isn't the most powerful engine in this class, but combined with the automatic it has a pleasant, responsive, and refined feel and is sweet-sounding. Handling is much better than the tall silhouette suggests, and once you get past the initial surprise of the tall driving position, you'll find handling to be reasonably crisp, with good maneuverability. 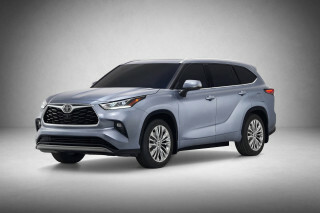 A carlike unibody design, surprisingly, is what underpins the Pilot, but it's been bolstered structurally with some of the benefits of an SUV so it's able to draw from the best of both worlds. The Pilot tends to ride a little firm, but it's great at powering through deep snow or mud thanks to a true Lock mode for the available four-wheel-drive (actually all-wheel drive) system. The 2012 Honda Pilot offers three usable rows of seating, and pretty good comfort--though a cluttered instrument panel keeps it from being a delight for frenzied parents. .
Front seats are generously sized and excellent for long road trips, while the second-row seats slide fore and aft for easy access to the third row or to get just the right balance of legroom between rows. Both the second and third rows fold forward and are split 60/40. About the only thing that keeps the third row from being able to accommodate all adults is headroom, which is tighter at the far back; also entry and exit to that third row involves a little bit of contortion. From a practicality standpoint, the Honda Pilot interior excels; it brims with cubbies, holders, and bins for all sorts of small items. Oddly, the chunky, oversized, simplified aesthetic doesn't carry over to instrument-panel controls, which feel cluttered (although we prefer the sea of buttons to a touch-screen interface). The hard-plastic surfaces and trims used throughout the dash are disappointing, given the Pilots relatively soft, family-oriented purpose. However otherwise the Pilot feels very refined and quiet—and Honda has made further improvements in this area for 2012. 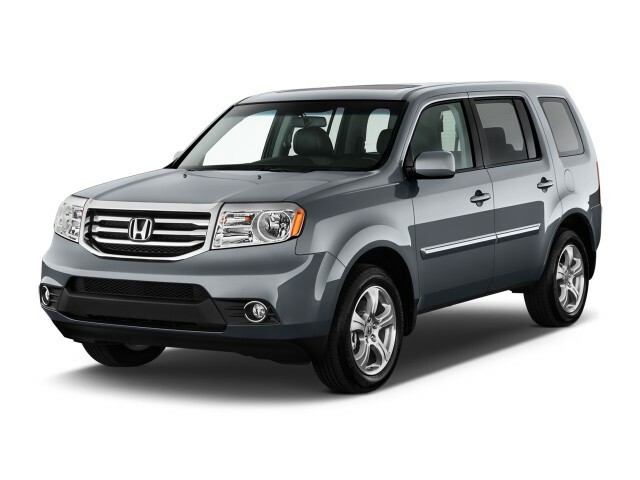 The 2012 Honda Pilot is one of the safest, most secure family picks. The Honda Pilot is a longtime safety leader among mid-size crossovers and SUVs, and while its crash-test ratings are respectable, they're not altogether the best in the class today. According to the revised federal NCAP crash-test program that was phased in last model year, the Pilot earns four stars (out fo five) overall, with four stars for frontal impact and five stars for the new side pole test. The Pilot has also been recently retested by the IIHS and has improved its ratings in the roof strength category--so that it now achieves a top 'good' result in every category and regains Top Safety Pick status. Standard safety equipment in the 2012 Pilot includes front side airbags, side-curtain bags that cover all three rows, and active head restraints, plus electronic stability control and anti-lock brakes. While boxy vehicles like the Pilot tend to be a bit better for outward visibility, the thick rear pillars in the Pilot, combined with its ride height, conspire to make it challenging for shorter drivers especially. Check for yourself, and you might want to opt for the backup camera--which, unfortunately, comes only in Pilot EX-L and Touring models with the nav system. The 2012 Honda Pilot offers some exciting features and options, but you'll have to move to EX-L or Touring models (and spend a lot more) to get some of them. The 2012 Honda Pilot is offered in four different trim levels—LX, EX, EX-L, and Touring, each of which is offered in 2WD or 4WD—but to get all the features you like, you might end up having go with one of the upper trims. 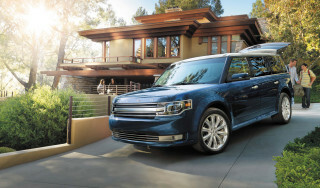 You'll have to step up to the EX-L and Touring to get upgraded leather upholstery and other tech features like Bluetooth, USB/iPod connectivity, a power tailgate, or a navigation system. In fact, you have to get the navigation system in order to have a USB input. Base Honda Pilot LX models come with rear air conditioning, keyless entry, cruise control, and a seven-speaker sound system, while the top-of-the-line Touring includes a host of tech features, such as a nav system, a rearview camera, a Bluetooth hands-free interface, a USB audio plug, backup sensors, and available rear DVD entertainment. Across the model line, from a feature standpoint, the big news for 2012 is top-and-center on the dash; Honda has brought the information screen it terms i-MID—a color LCD screen that shows trip computer and audio functions up more in the line of sight. It also includes enhanced steering-wheel controls. Also for 2012, the navigation system has been updated and includes 15 GB of media storage. You'll need to step up to EX-L or Touring trims to get upgraded leather upholstery. That said, base 2012 Honda Pilot LX models come with rear air conditioning, keyless entry, cruise control, and a seven-speaker sound system, while the top-of-the-line Touring includes a host of tech features, such as a nav system, a rearview camera, backup sensors, and available rear DVD entertainment. The 2012 Honda Pilot is one of the more efficient picks if a V-6 and three rows of seating are must-haves; otherwise you can do better with some four-cylinder models. 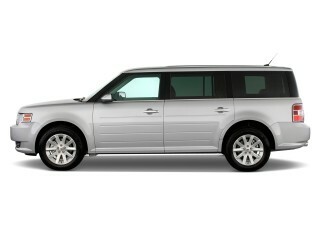 The 2012 Honda Pilot really isn't all that great of a pick for shoppers looking to green their footprint. A number of other mid-size crossovers in the same class as the Pilot now offer a more economical base four-cylinder engine; but the Pilot only gets a V-6—and still not a particularly fuel-efficient one, at that. A cylinder-deactivation system helps the V-6 cut fuel consumption while coasting or cruising, but it seems to be the new six-speed automatic transmission introduced this year that makes the biggest difference—now placing EPA ratings at 17 mpg city, 24 highway with four-wheel drive. Also, the front-wheel-drive model earns a more impressive highway rating of 25 mpg—making it the most fuel-efficient three-row eight-passenger vehicle, according to Honda. Quality and dependability well above average.